The Progress & Freedom Foundation Blog: Is Wikipedia Dying or Just Maturing? 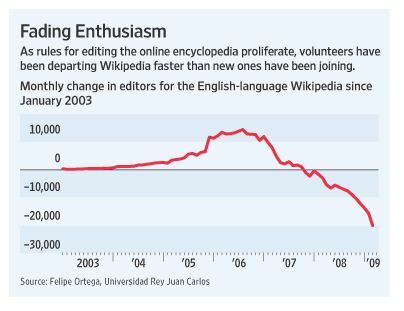 In the first three months of 2009, the English-language Wikipedia suffered a net loss of more than 49,000 editors, compared to a net loss of 4,900 during the same period a year earlier, according to Spanish researcher Felipe Ortega, who analyzed Wikipedia's data on the editing histories of its more than three million active contributors in 10 languages. Eight years after Wikipedia began with a goal to provide everyone in the world free access to "the sum of all human knowledge," the declines in participation have raised questions about the encyclopedia's ability to continue expanding its breadth and improving its accuracy. Errors and deliberate insertions of false information by vandals have undermined its reliability. But as it matures, Wikipedia, one of the world's largest crowdsourcing initiatives, is becoming less freewheeling and more like the organizations it set out to replace. Today, its rules are spelled out across hundreds of Web pages. Increasingly, newcomers who try to edit are informed that they have unwittingly broken a rule -- and find their edits deleted, according to a study by researchers at Xerox Corp. "People generally have this idea that the wisdom of crowds is a pixie dust that you sprinkle on a system and magical things happen," says Aniket Kittur, an assistant professor of human-computer interaction at Carnegie Mellon University who has studied Wikipedia and other large online community projects. "Yet the more people you throw at a problem, the more difficulty you are going to have with coordinating those people. It's too many cooks in the kitchen." Let's say it's true that the new guidelines have resulted in fewer people contributing. Is that that automatically a bad thing? I suppose it depends on other variables that are harder to measure. Namely, quality metrics. This is where every discussion about Wikipedia gets sticky. Personally, I'm a big Wikipedia fan and think it represents crowdsourcing and online collaboration at its finest. But I'm not one of those Internet pollyannas who claims Wikipedia represents the pinnacle of human knowledge or some sort of proof that the collective "hive mind" produces better results that individual or proprietary efforts. Rather, I think both models and modes of production have their place and their own strengths and weaknesses. The value of Wikipedia lies in the sheer diversity of human interests covered. The staggering array of topics for which someone has seen fit to create an entry never ceases to amaze--and inform--me. But not all entries are equal, and some are downright pathetic. That being said, if you treat Wikipedia as a launching pad--and not the ultimate destination--for your investigation of an issue, then this isn't a problem. Most people understand that there are other sources out there to consult, and Wikipedia entries typically do a nice job pointing readers to many of the best things to look at for additional information or perspectives. And even if the entry does not offer outbound links, you're still free to search for other sources! But for the vast majority of topics under the sun, a Wikipedia entry now exists and offers a great place to begin--again, not end--your search for enlightenment. Nonetheless, the quality issue for Wikipedia remains a problem for many. Personally, I welcome Wikipedia's recent changes and think it's a sign that the Wikimedia Foundation takes quality control seriously. If, in an effort to improve the quality of entries, new posting guidelines result in small drop-off in the number of contributors, some of us can live with that. The question is: Does it diminish Wikipedia's overwhelming strength--diversity. I'd hate to think that certain niche topics go uncovered because new guidelines are overly restrictive. Regardless, I think the folks at the Wikimedia Foundation are on the right track here. I think that's spot on.